» Full batch recovery, no separate scavenging system needed. »	Proper sealing which allows the filtration of volatile, toxic and inflammable products. Any type of filtering media singularly or in combination, can be used to achieve required micron efficiency. Easy removal and cleaning of the Cartridge Assembly. Filtration of toxic, hazardous, explosive materials. No solid inside the vessel, complete recovery of liquids. Complete cake retains over the plate. Uniform filter-aid bed can be formed. Reduces the cost of expensive solvents. 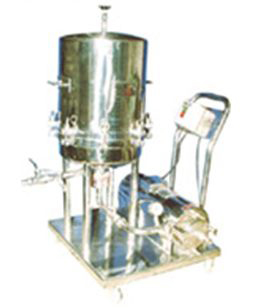 • Complete filtration of the batch without any hold up due to reverse flow of liquid hence large saving in time & cost. • Back wash facility can be provided for continuous operations. • No scavenger arrangement required. • The cake, filteraid & solids remain totally enclosed allowing filtration of toxic, hazardous & explosive liquids. • No contamination of internal surface of shell. • The top dome structure ensures fast & easy removal of cartridge assembly & cleaning of cake.